Since her first novel, Blindsighted, made the CWA’s Dagger Award shortlist for “Best Thriller Debut” of 2001, US author Karin Slaughter has sold more than 30 million copies of her books and been published in 32 languages. Most of her novels are detective thrillers, set in present day Georgia. Her latest release, Cop Town, is a departure, a crossover between detective and general fiction. Set in Atlanta, Georgia, in 1974, Cop Town portrays a hell-hole of bigotry, racism, misogyny, homophobia, religious sectarianism and class suspicion. The story follows a rookie police officer as she starts her career in a newly gender-conscious department. From a privileged background, newly widowed Kate Murphy is partnered with working class Maggie Lawson, the first female police officer from a cop family. Class isn’t the only barrier which divides these woman as they set about trying to find the culprit of a recent spate of cop killing. Each has to work hard to earn her place in the male-dominated force, and there’s little female solidarity shown – at least, initially. Throughout the novel, Slaughter challenges stereotypes of women as “naturally” collaborative and supportive, peacemakers and homemakers. Rather, she shows her female characters actively resisting the expectations of such roles, their struggles typical of the era before “women’s lib” took hold. Australian crime authors P M Newton and Angela Savage have discussed how violence against women is used as entertainment in much recent crime fiction. For this reason, I found Slaughter’s portrayal of women not just as victims of violence, but also as perpetrators, particularly interesting – and problematic. In our current age of the “war against terror” and extraordinary renditions, Slaughter’s seemingly unselfconscious reversal of gender stereotypes runs the risk of reinforcing yet another female stereotype, that of the ball-breaker. The portrayal of women isn’t the only problematic element of the book. For me, the serial cop killer motif lacks sufficient motivation to be really convincing, although the ending is thrilling and rewards the reader’s persistence. I think the whole world is gonna change. For me. For Kate. For the blacks. For the browns, yellows, greens. For you. Especially for you. In this light, Cop Town gives an insight into the beginnings of a revolution in cultural values that is still being played out today. Karin Slaughter will be touring Australia in August (details here). 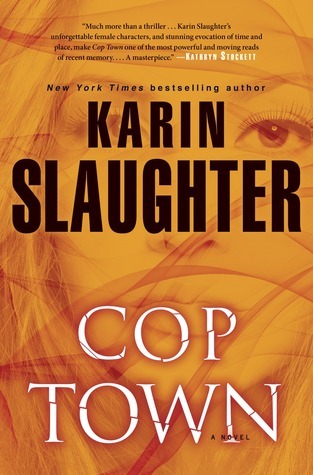 An ebook copy of Cop Town was kindly provided to me by the publishers through Netgalley. I know I’m a bit late in my blog reading/visiting (life has gotten awfully chaotic lately) but I couldn’t leave this post without making some sort of comment as Slaughter is one of the authors whom I have stopped reading due to a combination of extreme violence and troublesome female characters. Actually in the last book of hers I read all the characters of either gender troubled me as they were all extreme versions of some stereotype or other and I’m not convinced that simply reversing a stereotype makes the character intrinsically interesting. To me Slaughter seems to have lost the art of nuance (or perhaps she never had it and my tastes have changed from my early days of reading her books). That’s very interesting, Bernadette. This is the first of hers I’ve read (or, can remember having read!). I thought the women perpetrating violence might have been new.